When one thinks “ancient Egyptian art,” pyramids and mummies usually pop into one’s mind. Not mine (as you might know). Several years ago I went to the Museum of Art at the Rhode Island School of Design when they held an exhibition on ancient Egyptian faience objects. It is one of the most ancient of ancient Egyptian materials to make works of art, and really, in my mind, the most beautiful coloristically. I routinely seek out faience objects when I visit museums with sizeable Egyptian holdings, as I did recently at the MFA in Boston (lots of amulets!). Now if only I could find a tube of oil paint in the primary color of faience, which is a brilliant blue-green! Although faience is often categorized as “ceramics,” it is not made of clay. It is made of silica, from sand composed of crushed quartz, and small amounts of lime. Faience would be better associated with glass, as silica and lime are used in making glass. Egypt is rich in silica in the form of desert sand. The silica forms the bulk of the body. Water is added to ground silica/sand, with lime and quartz grains added as it dried to prevent it from crumbling. Like ceramics, the final step in the process was firing and glazing. The body of the object was covered with a soda-lime/silica glaze with copper added for the distinctive blue-green color. In ancient Egypt, the production of faience developed during the pre-dynastic period, roughly from 4000 to 3200 BCE. The earliest known objects made of faience were beads for necklaces and belts. During the Early Dynastic period (2920-2650 BCE), the size of faience pieces increased to include numerous objects used in religious ceremonies and burials, as well as tile decoration on temples and tomb precinct buildings. The most commonly seen objects in museums are beads, amulets, rings, pendants, and small ushabti (receptacles for the deceased’s spirit). 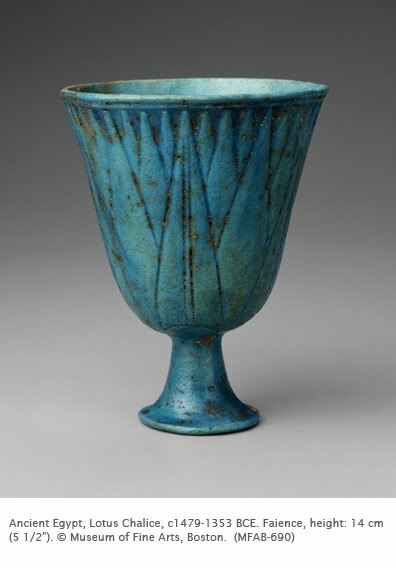 Chalices such as this were common tomb objects in Egypt. Aside from the usual reference to providing for the deceased’s needs in the next world, faience was a particularly relevant material for tomb objects. The word for it – tjehnet – is related to those for the properties of “gleaming,” “shining,” and “dazzling.” This not only refers to the faience’s physical properties, but also the equating of the rising sun with rebirth after death. The lotus flower, too, was a symbol of rebirth, because the lotus flower opened every morning to the rising sun. This chalice appears in the set Window in Time: Ancient Egypt.